What Does It Mean To ‘Slip A Disc’? | Dynamic Physiotherapy & Sports Injury Clinic Inc.
What Does It Mean To ‘Slip A Disc’? Our spinal columns contain a series of bones, known as vertebrae, that are stacked on top of each other. Each bone is protected by a disc that acts as a cushion. Discs absorb the shocks that happen due to our daily activities. When we walk, lift, twist – basically any movement we make – these discs keep our bones from rubbing against each other and becoming damaged from shocks. However, when we get hurt these discs can slip. If you are undergoing accident rehabilitation, you are probably very familiar with this. For those who aren’t undergoing traction treatment or rehab for back issues, below you’ll get an idea of what happens when you slip a disc. What Does Slipping A Disc Actually Mean? Each of our discs has a gelatinous inner part that is encased in an outer ring. After an accident, wrong movement, or even from the aging process, the inner part of the disc can protrude through its outer ring. When this happens it’s called a slipped disc. You may have heard the terms herniated or prolapsed disc. These are synonyms for slipped disc. The most common areas where slipped discs occur is the lower back. 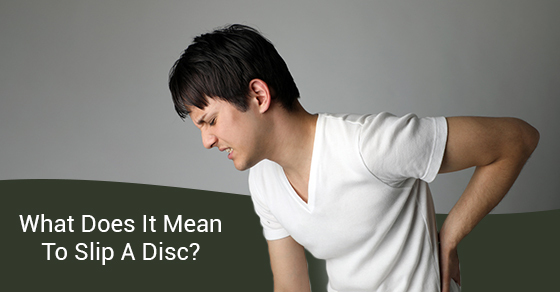 But, no matter where in your spine that you slip a disc, you will feel pain. Because our spinal columns are made up of a network of blood vessels and nerves, a slipped disc will put major pressure on the entire area affecting the nerves and muscles. When you slip a disc you will feel pain and numbness, sometimes on only one side of your body that extends to the arms and legs. You may also encounter pain that seems to worsen when you make certain movements (walking, turning), discomfort when sitting or standing, muscle weakness and a tingling or burning feeling in the area that is affected. Depending on the severity of your slipped disc, you may require surgery to repair it. This will be followed by accident rehabilitation where you will work with a physiotherapist to get you back to your old self. Accident rehabilitation usually consists of an exercise program that involves strengthening your back and the muscles that surround it. You may also need traction treatment, also known as spinal decompression therapy. This treatment uses a special machine (or can be done manually by your accident rehabilitation specialist) that relieves pressure on your spine so you can heal. For more information about our accident rehabilitation and traction treatment for slipped discs, please contact us. At Dynamic Physiotherapy, we’re here to ensure you can move without pain.